In this article, Wang Hui 汪辉 tells us about Chinese XieYi and other painting styles. Shexian, Huizhou, near Huangshan (Yellow Mountain) in Anhui province has long been recognised as one of the most important centres for Chinese painting, as well as home also to Old Hu Kai Wen Ink workshop and traditional inkstone workshop. We asked the Shexian painters to tell us about their techniques and materials. 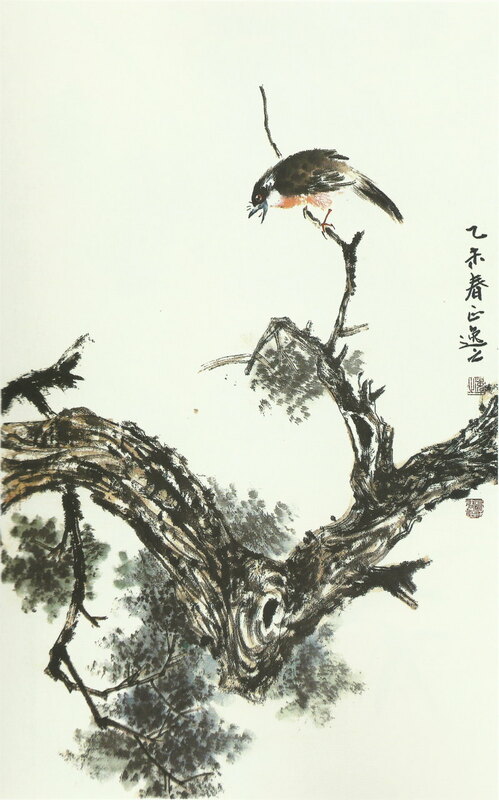 Wang Hui is a representative of the Xin’an school of painting which originated here. He is specialises in painting trees, birds, plants and fish. In this article, he is going to tell us how to appreciate Chinese XieYi paintings. Click on the paintings to view/browse. All these XieYi Chinese paintings are done with Chinese raw Xuan paper, and sometimes half-cooked Xuan Paper (see: Chinese Xuan 1,000 Year Old Truth Paper section on paper types. 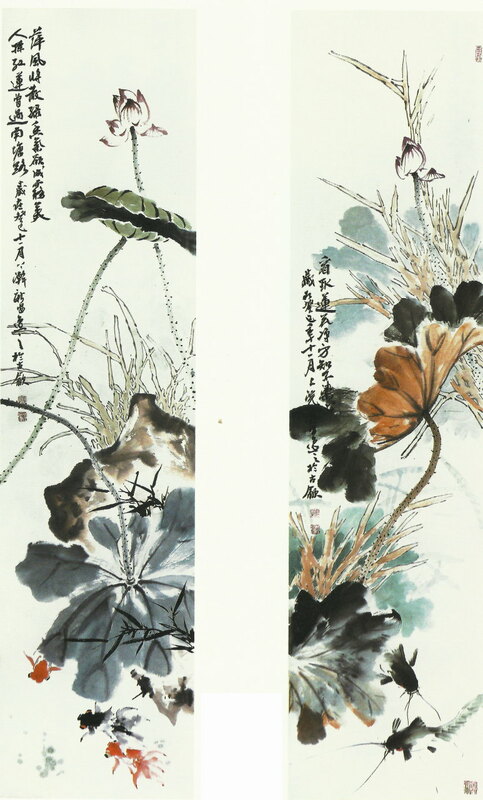 The essence of Chinese painting is how you use brushes and ink. Also, practicing calligraphy is important for doing well at Chinese paintings. Chinese painting is all about how you feel in your heart. In Song and Yuan dynasty in Chinese history, there was also a school which is very similar to Western realism oil painting. This school of Chinese painting is called ‘Gong Bi Hua’. The XieYi Chinese painting is disappearing. On the one hand, this is because after the open and reform of Chinese economy, Chinese society has been abandoning the old intellectual spirit; On the other hand, modern life style has made people fickle and are not as calm as people living in ancient China. In China history, there was one great painter called “Xu Wei” 徐渭. He suffered a lot mentally. He could overcome the poor life quality. However, he was living in a chaotic time, and was not able to contribute his intelligence to the country. He was even misunderstood by people and was thrown to prison. His life is very similar to that of Van Gogh. I think at the moment, if China wants to promote Chinese painting, we need to emphasize on the cultivation of our own hear. Now I am going to talk about the paintings one by one. 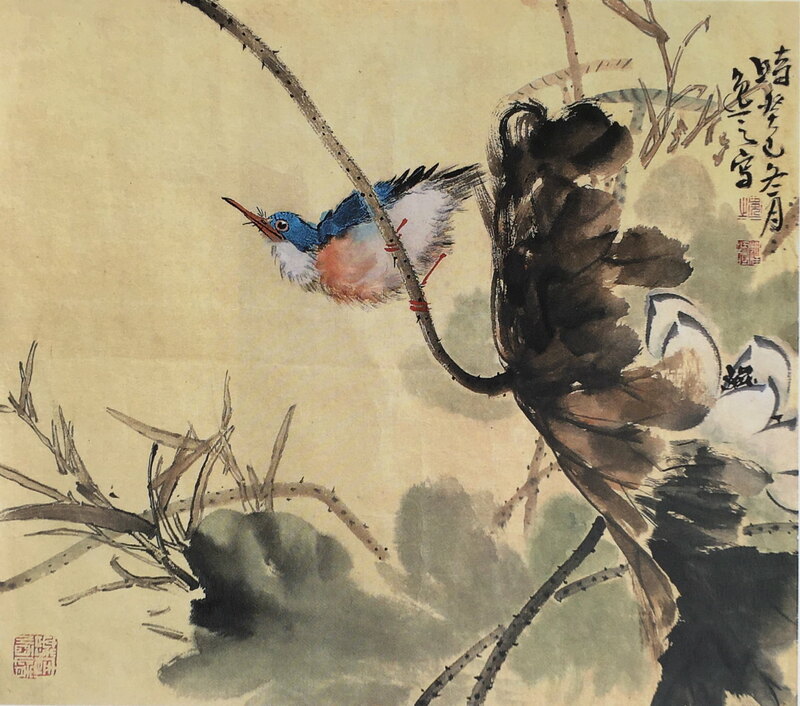 Chinese painting, especially this type, has very close relationship with ancient Chinese philosophies, especially philosophies from Chun Qiu War time. These thoughts have been more or less reflected in Chinese paintings. Also, a painting can reflect the artist’s life experience. Speaking of “Gong Bi Hua”, this type is more popular at the moment. They are very realistic. 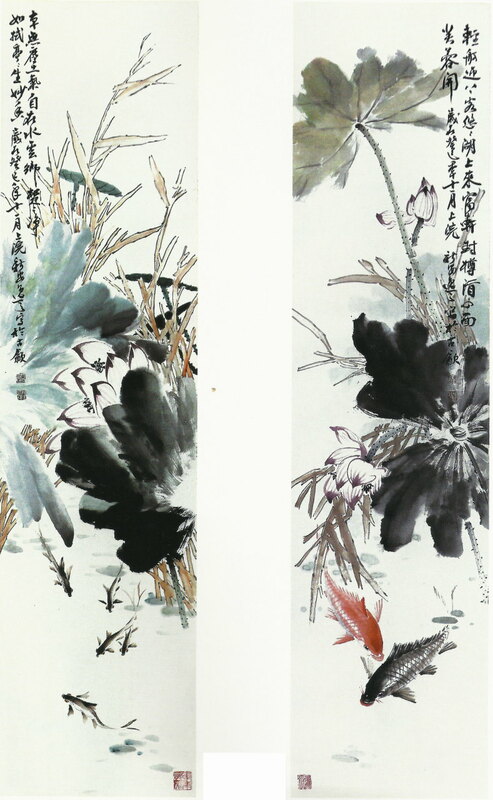 In contrast, XieYi Chinese paintings are like impressionism in West. 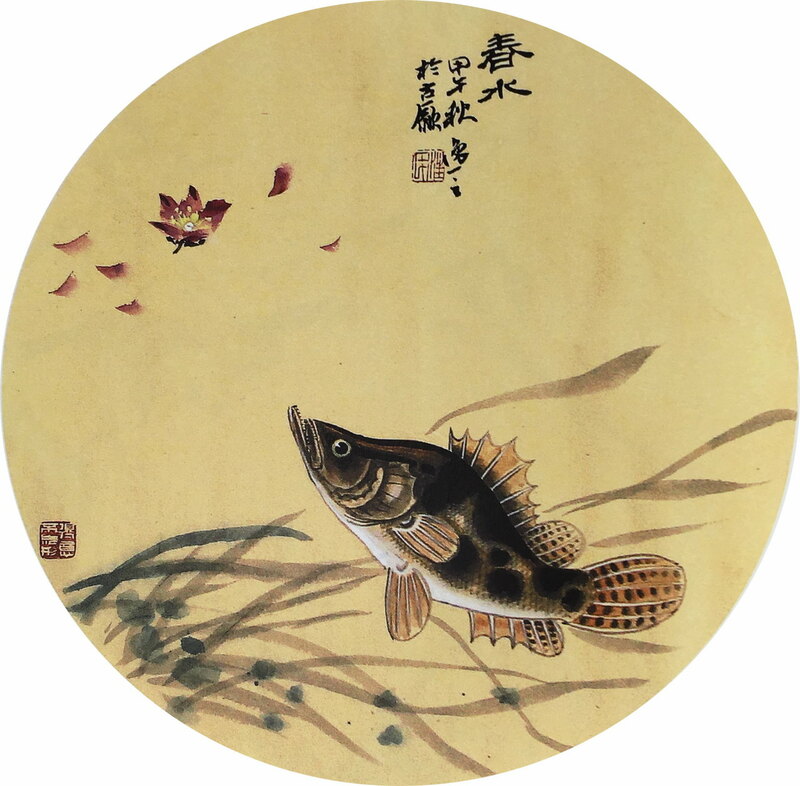 Chinese XieYi paintings have their own spirit. For instance, when preparing to paint this cypress (on the left), I wrote ‘the tree trunk perimeter is 40 meters, and the dark green tree goes up to sky as high as almost 1000 meters’. In fact, in the painting, you do not need to draw all these details to express how big the tree is. Not to mention, you are not able to draw the whole dimensions of such a big tree in one painting. Therefore, the Chinese way is to draw the details of a branch. If a branch can be so huge, then this branch will lead you to imagine how big the whole tree is. In fact, there are also paintings about the whole tree. For example, in this painting, I painted a very big tree trunk, with two birds resting in the tree leaves. The theme of this painting is ‘the garden of Eden’. It means this huge tree is paradise for the birds. In fact, this tree is also paradise for human beings, isn’t it? 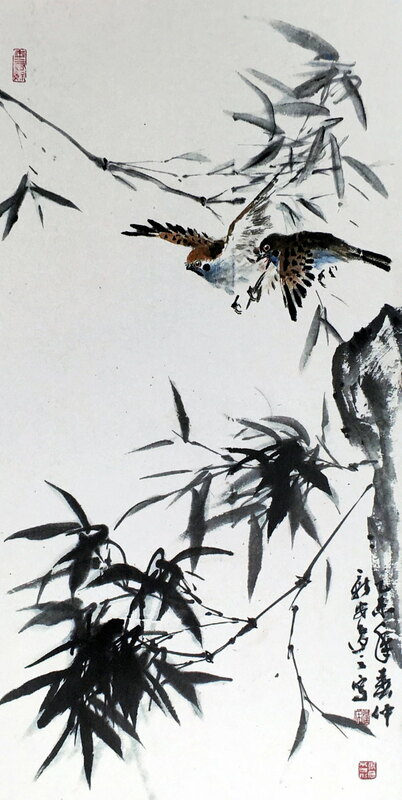 Chinese painting makes very good use of imagination and space. You have to understand the meanings expressed by the artist. Only you understand this, you could understand the feelings that the artist wants to transfer through the painting. Otherwise, you would not feel much impressed by the painting. This might not be like traditional west paintings. 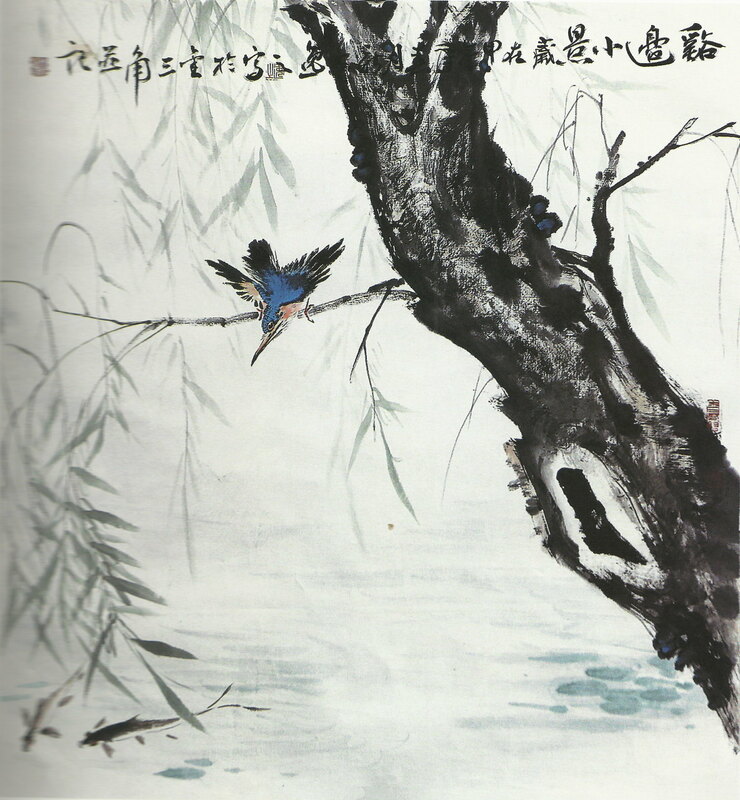 Chinese paintings are poetic. This painting is to express the beauty of spring by painting some flowers. Since spring means a lot of colors, painting some purple flowers in the painting expressed the spring touch. It is a very poetic expression. These next are 写意画 XieYi painting [“draw meaning” freehand painting]. Now, this painting is not very well sold in market. Almost no one would buy it. From the structure of the painting, very little information is painted. In old Chinese saying, it is ‘ use ink like using gold.’ It means you should only use the ink when it is extremely necessary. Although there is little information drawn in the painting, you could read a lot and could see a lot of changes of the brushes, inks, etc. This kind of painting require very high skills. On the one hand, you have to master the materials, including inks and brushes; on the other hand, which is even more difficult and important, is that the artist should have very deep understanding of arts and life. Another example would be this painting. It is a painting of bamboos. 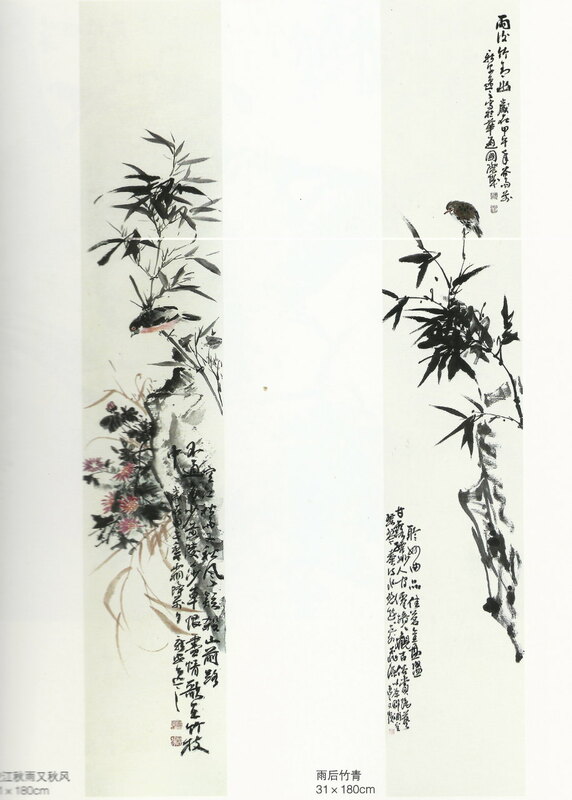 The different use of inks and brushes have created different images of the bamboos leaves. A small piece of leave could express so much. From the whole painting, it seems a bit light and unbalanced. Therefore, I wrote a poem on the bottom of the painting. This makes the whole picture harmonized. 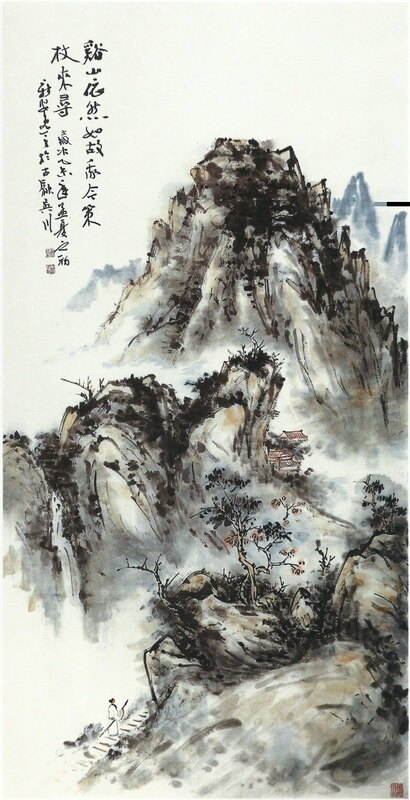 Chinese painting makes very good use of imagination and space. You have to understand the meanings expressed by the artist. Only if you understand this, can you understand the feelings that the artist wants to transfer through the painting. Otherwise, you would not feel very impressed by the painting. This might not be like traditional western paintings. I loved painting when I was little. At that time, my parents were not aware of importance to cultivate children’s hobbies. I didn’t go to any special art school. I learned all on my own. Interest is the best teacher. I kept teaching myself for over 30 years. Generally, whoever is better than me, they are my teachers. I learn from artists in Chinese history, from books, from friends, etc. Chinese painting is not like oil painting in west, which need special trainings. 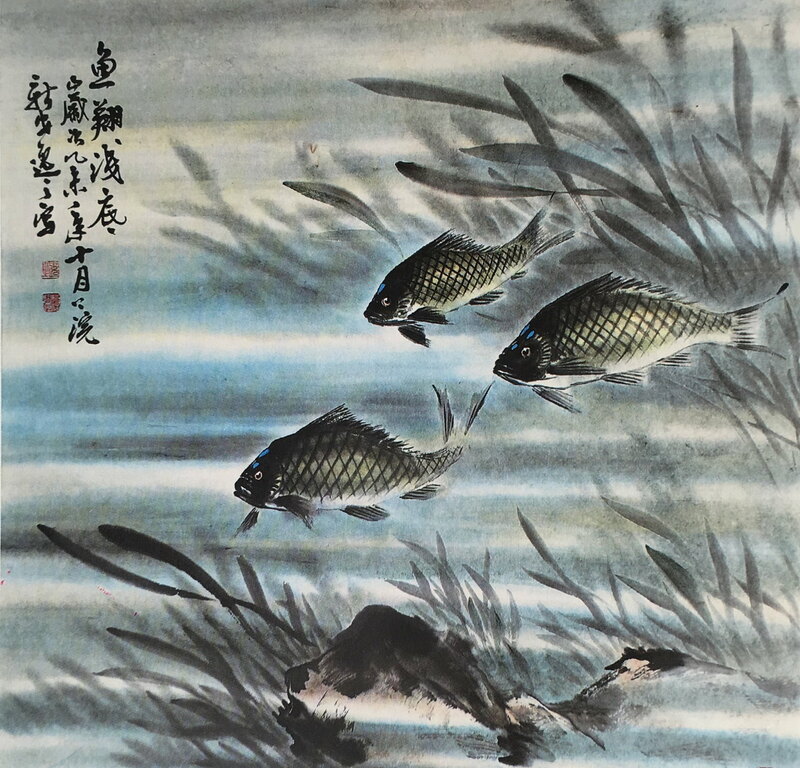 Chinese painting, especially XieYi Chinese painting, can not be taught at school because these paintings are based on your life experience. Teacher cannot teach you life experience since everyone has different life experiences. Different life experiences lead to different paintings. Oil paintings can be copied while Chinese paintings cannot. Even the same people cannot repeat the same painting because his mindset and circumstances at that moment have changed. 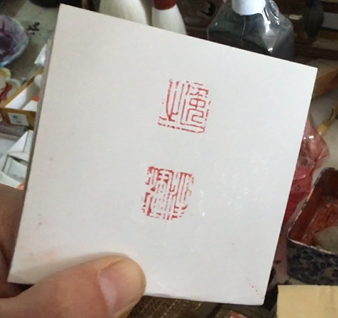 This is the unique place about Chinese painting. Chinese painting has to be done without any stop, and you can not reduce but add. Oil painting can tolerate errors, but Chinese painting cannot. 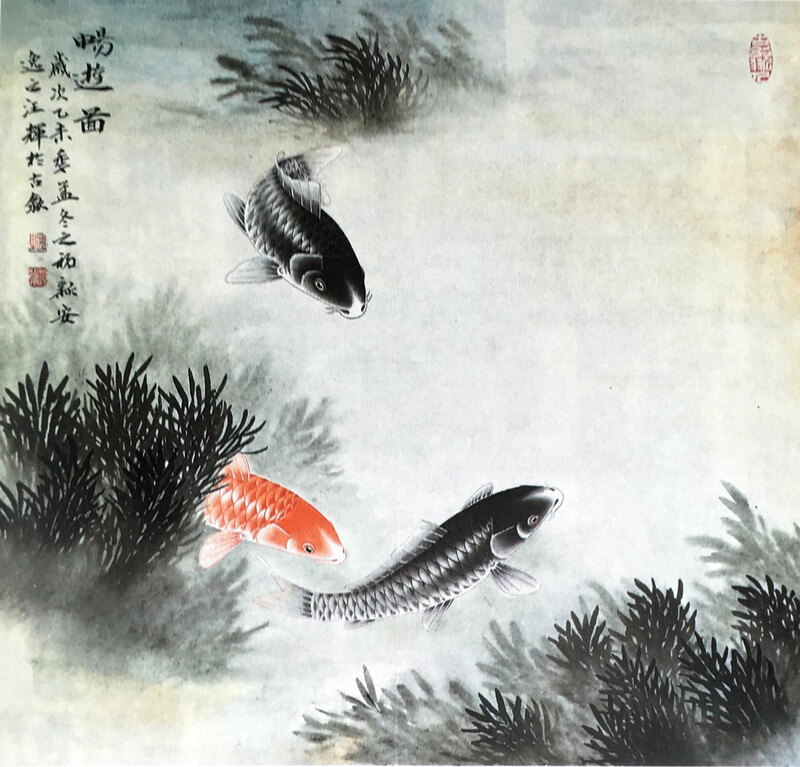 Chinese painting can be categorized into different types. There are paintings for landscape view, profiles, flowers and birds, etc. Also each group can be categorized into more sub-types. 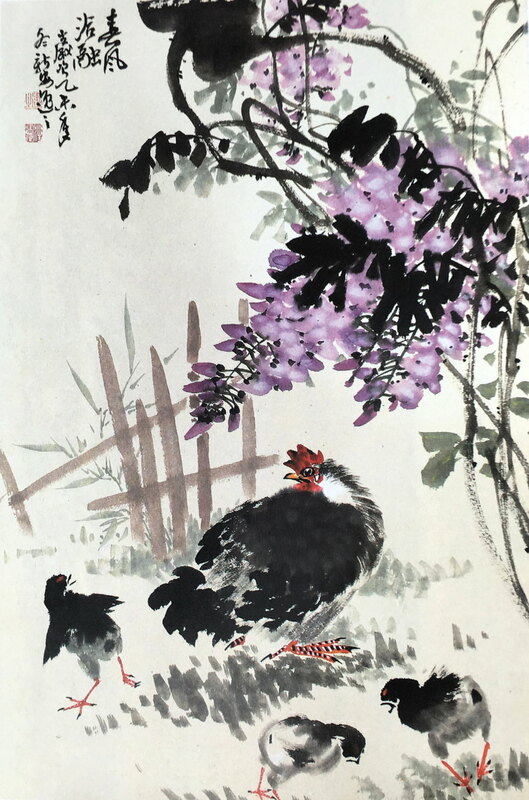 For example, there are many different type of paintings in flower and birds. Yan Ru is my name, and it has a reason. In Jin dynasty in Chinese history, a man called Tao Yuanming, wrote one article. The article is called < Biography of Mr. Wu Liu>. Yan Ru are the words from this article. I even wrote one poem to explain these two characters. The house is completely empty, no money. This is a poor family. I have a bed. Half of the bed is for me to pile books and the other half of the bed for me to sleep. This was my life situation several years ago. I love painting. After I finish a painting, I go fishing. After fishing, I like a glass of wine. Kuaiji, a town in Shaoxing city, has very good wine. I imagine when I am old, I walk to there with cane to buy wine. Regarding the painting papers, XieYi paintings need to use uncooked Xuan paper while Gong Bi Hua cooked Xuan paper. For example, this type of painting needs to be done on uncooked Xuan paper. Xuan paper needs to be stocked for one to two years before being used when the Xuan paper has been oxidized enough. The differences between papers are very subtle. You have to master different kinds of papers in order to paint well. Traditionally-made Xuan papers are very good and modern-made Xuan papers also have their own advantages. Tree barks are crucial materials for making Xuan paper. In Sichuan, bamboo leaves are also used to make paper. For most artists, it is very difficult to master bamboo papers. 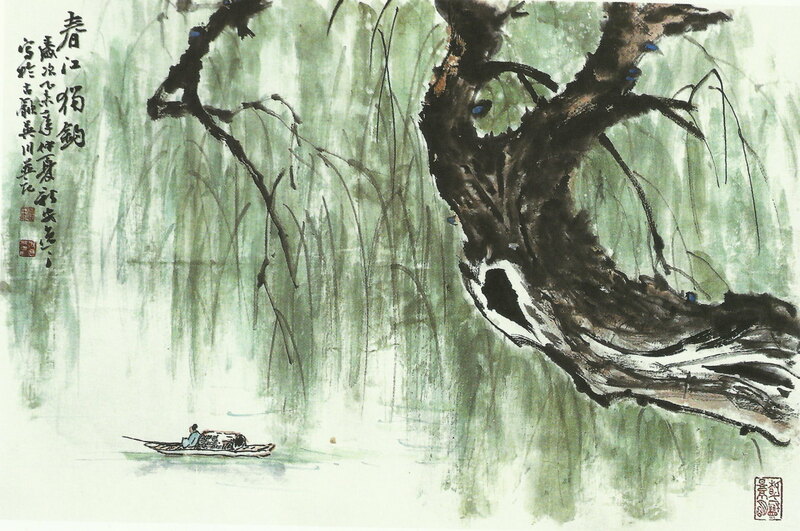 Zhang Daqian, a very famous contemporary Chinese painter, liked using bamboo leaves paper very much. He is from Neijinag, Sichuan. He can master this paper and make the most of it when painting. Many places produce Xuan papers but the best Xuan paper is made in Jing Xian, which is also called Xuan city. Speaking of seals, many people do not understand it. It is necessary to have a set of seals, one “Ying” and one ‘Yang’. The size should be no bigger than the size of characters on the painting. It is important to pay attention to these details. Today I am going to show you how to do a Chinese style painting. It is not creating an artistic piece. I am just showing you the basic steps. 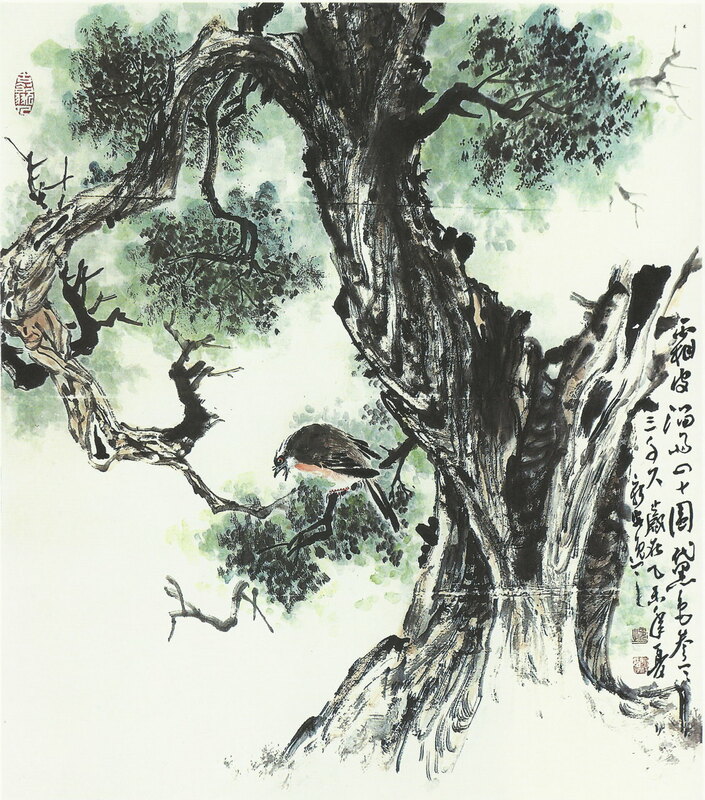 Chinese paintings have different categories, such as landscape, profile, flowers & birds, etc. This is a very simplified way to categorize Chinese paintings. Today, I am going to show you how to paint fish. When doing Chinese painting, you have to know clearly on what you are going to paint. You have to know the shape of the things you are going to paint. When you are painting, you can use your methods of using brushes and inks to express the deep meaning of the painting. I use the middle and side part of the brush. The inks can be light, strong, dry, and wet. You can use the point of the brush, the body, and the bottom of the brush to create different images. I used colors to paint, now I am going to use some ink. I want to express Zhuang Zi’s idea about freedom. This is ‘dip ink’, which mean eye. Then, I use some dark green ink to draw water grasses. Some plants are gathered while others are scattered. This side has more grass, while the other side less. 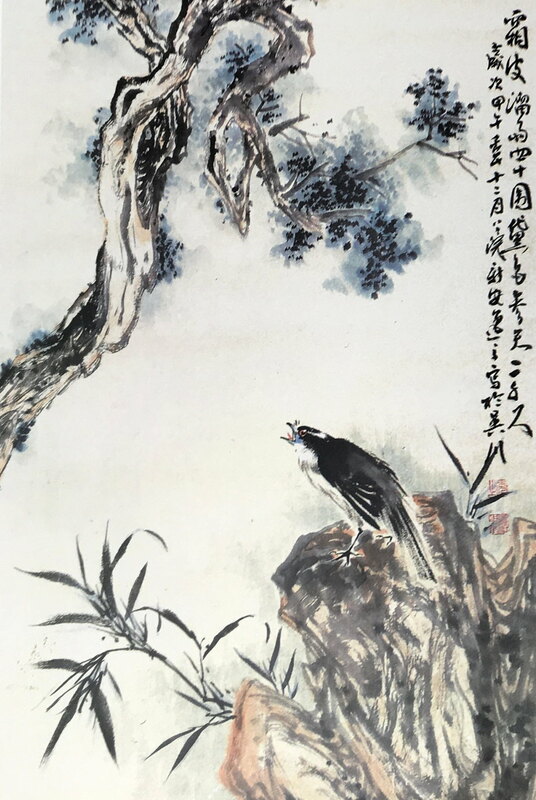 Chinese paintings pay a lot of attention to the comparison, black and white, abundance and few, strong and light, dry and wet, gathered and scattered, etc. Therefore, we think there are many ways to interpret Chinese paintings. For example, now I am ‘Dian Tai’. During this process, I should be careful about how much of ink I can use, where, and how much strength I should use on brushes. Me ha encantado, tanto las pinturas como el artículo. gracias Mar, mientras más gente quiera los artículos, ¡más seguiremos escribiendo! Muy interesante el articulo. El estilo Xieyi es el que practico y me resulta un estilo muy libre para expresarse a través de la pintura, sin detalles innecesarios. Gracias! Merci pour cet article, trés inspirant! Although I’ve studied art for number of years, i find i know little. The more i search i’m amazed at the small things that make such a large change in how you see things. Use ink like gold, Less is more!